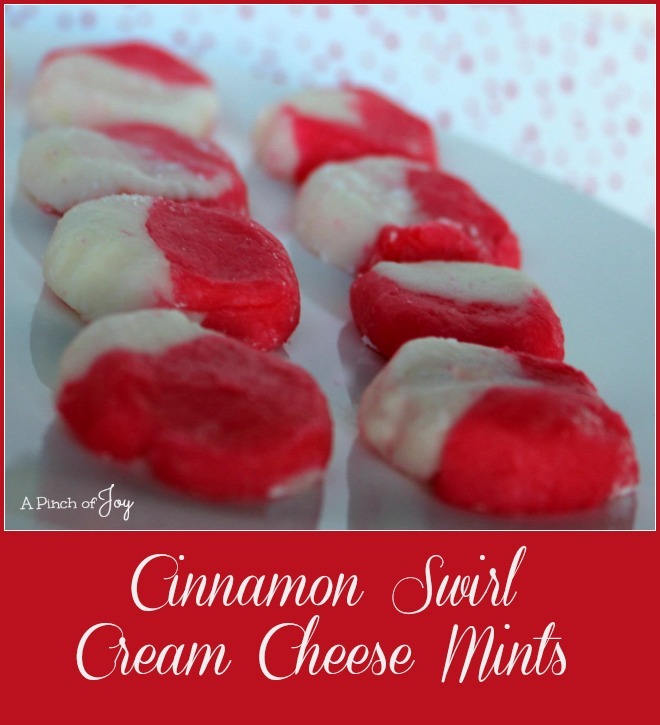 A new twist on a classic candy – Cinnamon Swirl Cream Cheese Mints. I like the surprise of the cinnamon flavoring since the classic version calls for mint flavoring of some type. I used gel food coloring for a more intense red, adding only a small bit at a time until I had a bright color. I used Wilton Candy Flavorings. Both are available in hobby stores and sometimes grocery stores in the cake decorating section. Or – during my tenure as a pharmacy tech I found out that many pharmacies order candy flavorings to sell over the counter at this time of year! Who knew! Candy flavor is more intense than the liquid flavorings so less is needed and that keeps the candy from being too moist. When you finish mixing the candy, it will likely seem a little sticky. Try to resist adding more powdered sugar as chilling it makes it firm and easier to work with. However, if it is quite sticky and appears moist go ahead and add more powdered sugar before chilling. It is important to only take out enough of the candy mix at a time to roll about 8 inches long. Keeping the rest chilled makes it easier to work with when you are ready for it. 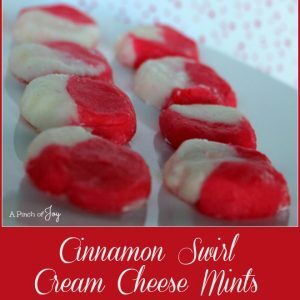 A new twist on a classic cream cheese mint! Add 2 cups of confectioners sugar and mix well. Continue adding one cup of sugar at a time until 7 cups are mixed in. Mixture should be like stiff cookie dough. If it is more moist than sticky, add another ½ to 1 cup of powdered sugar. Divide mixture into two equal parts. 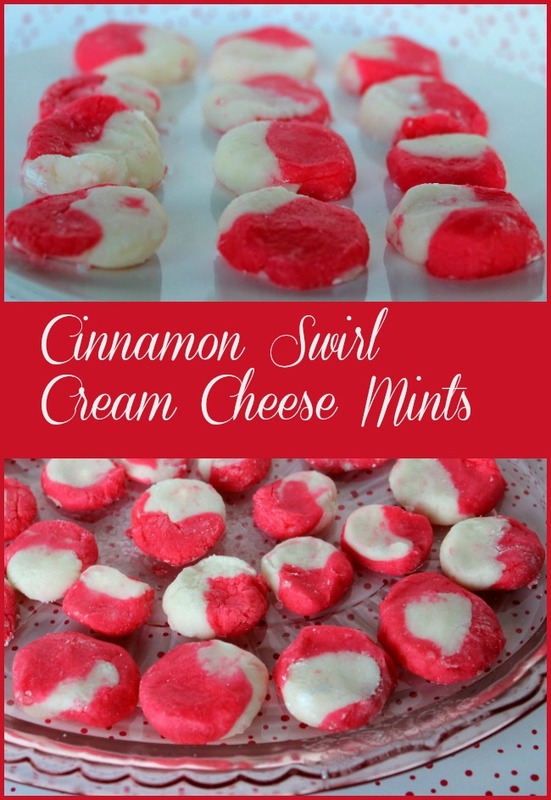 Add red gel food coloring, along with the cinnamon flavoring and mix well. Cover and refrigerate for two hours. Add ½ teaspoon flavoring to the second half, mix well, cover and refrigerate for 2 hours. Remove one bowl from refrigerator and, working quickly on wax or parchment paper brushed with powdered sugar, form a rope about 8 inches long and half inch in diameter. Return bowl to refrigerator and repeat with other color of mixture. Lay two ropes side by side and slightly twist them together by grasping one end of the combined ropes and turning three or four times. Work with only a small portion of the candy mix at a time. Immediately slice twist into half inch to one inch thick slices, depending on the size you want. Flatten with fingers and form as needed. Dip bottom of candy in powdered sugar before placing on parchment or wax paper lightly brushed with powdered sugar. Leave to dry for a few hours before storing in airtight container.